1. Katherine ROET, daughter of Sir Pain DE ROET ( - ), was born circa 1350. She married John of Gaunt DUKE OF LANCASTER in 1396. She died on [Julian] 10 May 1403. 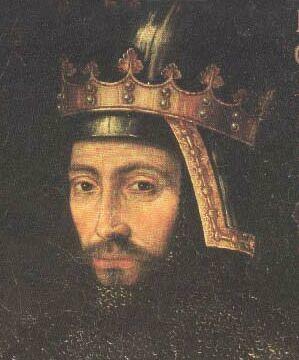 In 1359 Geoffrey Chaucer joined Edward III's army when France was invaded. He was taken prisoner and Edward III himself had to pay the ransom. In March 1360 Geoffrey was given his freedom when Edward parted with 16 pounds for this yet to be celebrated author's liberty. In 1367 Chaucer was given a life pension for being a valet of the King's household, Lionel died in 1368 so Chaucer transferred his services to John of Gaunt. John de Beaufort EARL OF SOMERSET (aft1371-1410). John was born between 1371 and 1373. He had the title '1st Earl of Somerset'. He married Margaret de Holand on 23 April 1399. He died on 16 March 1410 in Hospital of St. Katherine-by-the-Tower, London. 2. Sir Pain DE ROET has few details recorded about him.